An excerpt from Fouchard’s Les marrons de la liberté (1972), translated by A. Faulkner Watts. Fouchard was a renown Haitian historian, journalist, and diplomat. 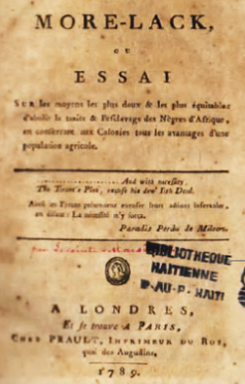 His book won the Grand Prix Littéraire Caraïbes. Saint-Domingue was a mill in which slaves as well as cane were ground; it was the principal burying ground of the slave trade. The colony "devoured" its slaves at a dizzying rate, for which neither the continued and increasingly massive arrivals of slave ships nor even less the birth rate could satisfy. 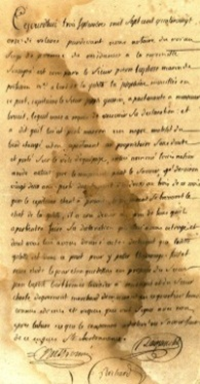 The [French] Code Noir established punishments permitted [to] the masters. It provided a range of penalties including that of death for a slave who struck his master or freedmen, or who committed "qualified thefts." Covered by such a policy, [one slave-owner] Saint-Martin l’Arada could with impunity assassinate two hundred of his slaves, [another owner] Caradeux, likewise, bury slaves alive, and [another] Garesché keep a slave in chains for twenty-five years. Maroons, using every guileful resource, made their escape by day and night, by small boat, mounted or afoot, by land or sea, individually or in groups. Group flights were by families, mother and children, husband and concubine, an entire family, or even a group of slaves or different [African] nations joining together for a collective escape. Almost always it was during the night that field slaves and factory workers ran off. House slaves, when they did not practice a craft that freed them from surveillance, had the option by day of being on commission. One such slave had, on the very day of his flight, killed a pig he had been fattening for months. A clever trick to allay any suspicion. Others who could read and write faked letters indicating that their masters had sent them out on a job. 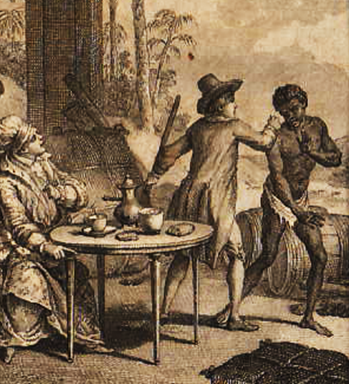 Maroons joined with slaves in revolt… Furthermore… the slaves in revolt, now became new Maroons, and did not remain isolated but moved to swell the existing bands of Congos, Nagos, or other "nations," recreating in Saint-Domingue the African tradition of warrior bands often grouped according to tribal origin.